Make no mistake about it: there's plenty of power here. With an Nvidia GeForce GTX 1070 8GB graphics chip, 32GB of DDR4 memory and an available G-Sync 4K display, this EVGA is equipped for heavy lifting. The SC17, as equipped, costs $2,799 (about £2,500, AU$3,591). It's not yet available in Australia, but you can sign up for pricing and availability notifications on EVGA's official Australian website. It's a lot of money, but significantly cheaper than the Blade Pro, and on par with the Alienware. Design wise, the SC17 doesn't do much to stand out. It's unassuming, but not unattractive. There's nothing flashy here. 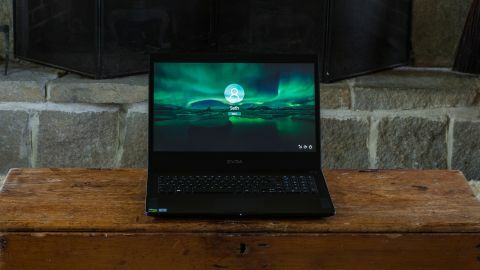 It exudes a utilitarian look but still has softness on the edges to keep it from seeming ostentatious, as is the case with most gaming laptops. The lid and interior are made of remarkably solid-feeling aluminum. The bottom of the computer is plastic, but it feels quite solid. There's a definite sense the EVGA is capable of standing up to some abuse, or could be used as a shield if a medieval combat situation were to arise. Fan vents run the width of the bottom and feel extremely sturdy. There's very little in the way of flex, which is great given how heavy the SC17 is. An intake vent lines the rear, just below the hinge. This is about as close as the SC17 comes to giving away its true purpose as a monster gaming computer. That, and its tremendous weight. As heavy as it is, this laptop is surprisingly thin. When closed, the SC17 measures just over an inch thick. It's not as svelte as the Blade Pro, but it's still impressive for a VR-ready laptop. The backlit, full-sized chiclet-style keyboard on the SC17 is a delight. The keys have a wonderful amount of travel and clickiness to them and, by virtue of being a 17-inch laptop, there's plenty of space to rest your wrists. Unlike the Blade Pro and Alienware 17, there's no RGB lighting here. There are also dedicated keys for overclocking, which is awesome. One push of the function key and the overclock button, and you're off to the races. The Intel Core i7-6820HK is unlocked and ready to be pushed to as far as 3.3GHz at the push of a button. The SC17 ‘only’ has a GTX 1070 8GB graphics chip, the smaller sibling to the Alienware R17 and Blade Pro's GTX 1080 – so, it's at a disadvantage power-wise. For its strengths, its biggest weaknesses are battery life and fan noise. When pushed, the fans can't be ignored. Playing just about any modern game starts them spinning. Fortunately, the built-in speakers are able to produce decent-quality sound to cover it up. The sound from the speakers is a touch on the flat side, though. Music and sound effects lose some of their depth. However, they aren't bad speakers – they just aren't great. It doesn't help matters that the power brick for the SC17 is huge, because there's no chance you'll be able to leave home without it. Dropped into your laptop bag with the already beefy, 9-pound SC17 means your shoulders are going to hate your guts.